One day when Samson was grown up, he went to Timnath to marry a young Philistine woman. As Samson passed the vineyards of Timnath, a lion rushed out of the woods and began to roar against Samson. Although Samson had no weapon, Samson and the Lion fought together with Samson using only his bare hands and his great strength, and he tore the lion to pieces. 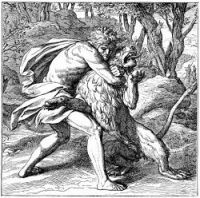 After a time, Samson passed the place where he had killed the lion and went to look at the dead body of the animal. 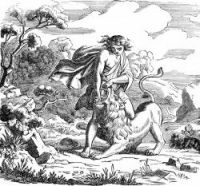 Some wild bees had made their nest in the lion's carcass, and Samson ate the honey that he found there. 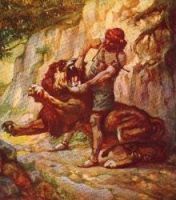 On this page you'll find nine illustrations of Samson and the Lion taken from my collection of antique Bibles and story books. You're welcomed to use these pictures of Samson and the Lion in your artistic creations. 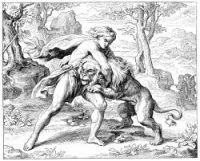 Click on the Samson and the Lion drawings below to see more details about saving a free Samson and the Lion image or about purchasing the images of Samson and the Lion at a higher resolution.